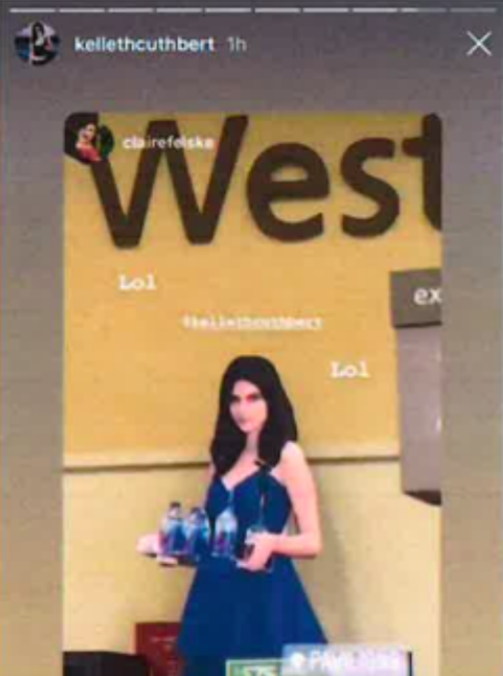 Fiji Water Is Now Suing "Fiji Water Girl"
"The irony is not lost on Fiji that Ms. Steinbach has now bitten the hand that feeds her." Model Kelleth Cuthbert — whose real name is Kelly Steinbach — became a viral meme known as the "Fiji Water Girl" at the 2019 Golden Globes in January. She made headlines again earlier this month when she decided to sue the company for unauthorized use of her likeness and identity, but she is now also being countersued by the bottled water company. "The irony is not lost on Fiji," lawyers for the bottled water company wrote, "that Ms. Steinbach has now bitten the hand that feeds her by suing the very company that is entirely responsible for providing her the opportunity and the means to capitalize on her fleeting 15 minutes of internet fame." In her lawsuit filed Jan. 31, Steinbach claimed Fiji and its parent company, the Wonderful Company, used a cardboard cutout of her advertising its product without her consent and that the company pressured her into being filmed signing a "fake document" to "simulate" being signed as a Fiji Water ambassador. She also said that the viral moment from the Golden Globes led to at least $12 million in brand exposure for the company and she would like her fair share. Fiji Water dismissed Steinbach's claims, and responded in kind with a countersuit, saying the model reneged on a valid agreement between herself and the company and alleging she is now attempting to "extort close to half a million dollars from Fiji." The company denied Steinbach's claim that she signed fake documents, citing photographic and video footage of her signing the agreement that they say was authentic. To support its claim that Steinbach was aware of her likeness being used, Fiji says in the countersuit that she posted images of her cutout on Instagram with "approving commentary" like the "LOLs" surrounding the image. 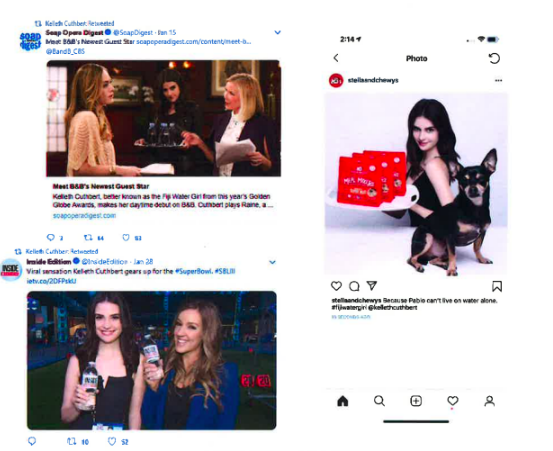 Fiji also provided examples in the suit of instances that Steinbach retweeted images of her meme that were repurposed for other brands to use as advertisements. Fiji said the model's lawsuit is "a blatant attempt to skirt her contractual obligation." In a statement sent to BuzzFeed News on Friday, Steinbach's representatives said Fiji's lawsuit against their model "is an obvious publicity stunt" to counter the company's "unlawful actions." "Kelleth will not be bullied by Fiji Water, the Wonderful Company, or its billionaire owners," the statement read. The statement said Steinbach's decision to sue Fiji was a "last resort" and that the company profited from the model's image without her consent and without paying her and that she "just wants what is fair." In a statement from when the drama between Steinbach and Fiji began, the company called the model's lawsuit "frivolous and entirely without merit." "After the Golden Globes social media moment, we negotiated a generous agreement with Ms. Cuthbert that she blatantly violated," the statement said. "We are confident that we will prevail in court. Throughout our history, we have had a sterling reputation working with talent." Prior to the suits between Steinbach and Fiji being filed, there was one celebrity who took issue with the "Fiji Water Girl" meme: actor Jamie Lee Curtis. Responding to a photo caption that said Curtis was "in danger of being upstaged" by Steinbach, the actor responded on Twitter, saying, "I specifically moved away from the blatant Fiji & Moet promotions." "The sponsors of events need to get permission from people before they try 2 take their picture with them," Curtis said. So, I specifically moved away from the blatant Fiji &amp; Moet promotions. I knew there was a photographer poised &amp; I moved as I didn’t want to be doing advertising for either. The sponsors of events need to get permission from people before they try 2 take their picture with them.